Building stronger shoulders can help prevent upper-body injuries and improve day-to-day functions. These four movements, suitable for all fitness levels, can result in more strength and stability. 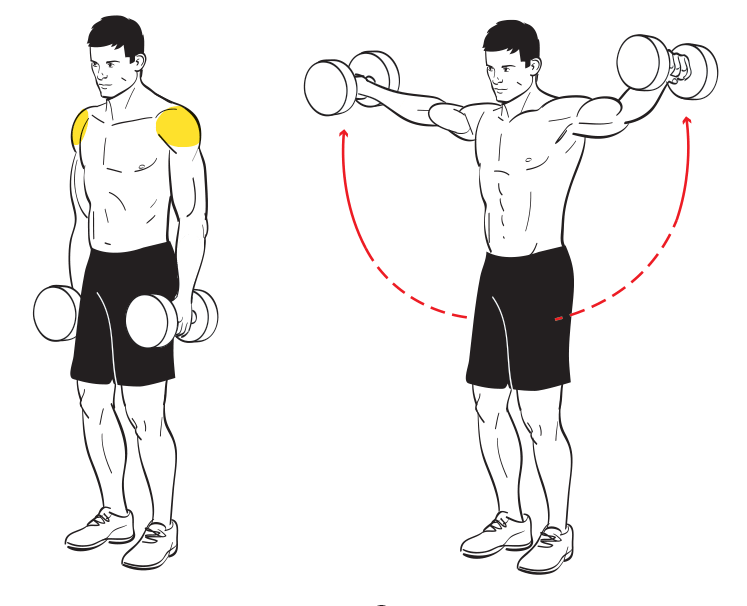 Everybody needs a set of dumbbells—especially for your shoulders. Dumbbells are versatile and easy to use, and they can strengthen more than just your muscles. Dumbells work your brain, too, as you try to balance and coordinate the movements. And because dumbbells engage more muscles to balance the weight, they help build greater overall stability in the area of focus. But good technique is key, so we asked Andy Coggan, director of the Fitness Academy at Gold’s Gym, for tips and a few of his favorite shoulder exercises. First 10 minutes: Stretch the upper body, shoulders and back muscles. Next 20 to 30 minutes: Shoulder exercises (listed below) paired with upper body training, such as chest, back and arms. Next 5 to 10 minutes: Light stretching. Last 10 to 20 minutes: Cap it off with cardio or high-intensity interval training. One of the biggest mistakes a beginner can make is choosing either too much or too little weight. Assess: Try 10 reps in good form. If you can easily go past 10 in good form, try a slightly heavier weight. Tweak: If you’re struggling to get 10 or need to engage other muscles to finish the rep, you’ve gone too heavy. Go down about 5-10 pounds. The sweet spot: If you can do 10 reps with great form and feel like you have just 1-2 reps left in the tank, you found the perfect weight for you. There’s more than one way to train, Coggan says. And actually, doing the same thing repeatedly is a common mistake, he says. Bodies begin to adapt to an exercise and need variety to continue making progress. Just make sure you’re doing the basics right. Gold’s Gym trainers, who can introduce a wide range of workouts, can make sure you’re using proper technique. Here, Coggan offers four exercises to try, as well as modifications for each fitness level. 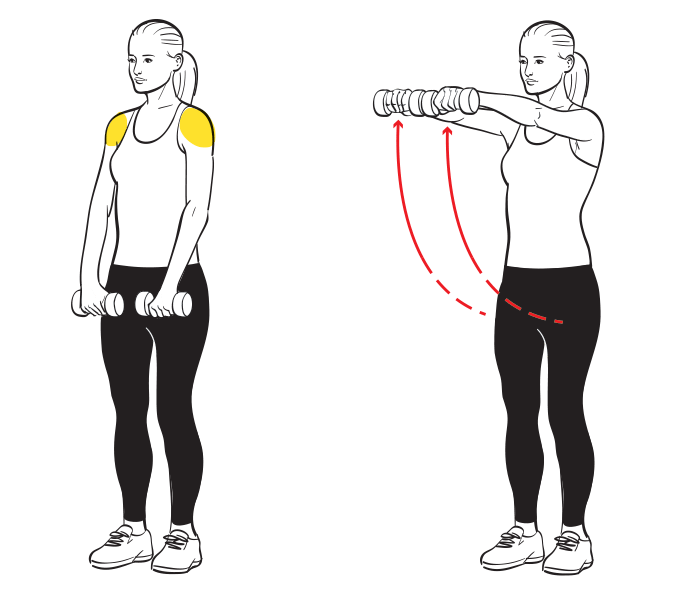 This exercise is an effective move to isolate your anterior deltoid muscles, or the front of the shoulder. Standing, hold dumbbells in front of you with your palms facing your legs. Keep your elbows and knees slightly bent as you raise your arms straight in front of you to shoulder level. Slowly return to the starting position. Beginner: Move up and down at an even pace. Two seconds up, two seconds down. Don’t lock out the elbows or lean back during execution. Intermediate: Try decreasing the rest between sets to 30 seconds, and combine front, lateral and reverse fly shoulder raises in one sequence. Expert: No rest between sets. Combine front, lateral and reverse fly shoulder raises in one sequence. Lifting laterally activates your posterior deltoids and upper-back muscles. Standing, hold dumbbells with your palms facing each other. Keeping your elbows and knees slightly bent, raise your arms out from your sides in wide arcs to about shoulder level. Slowly return to the starting position. This exercise targets your posterior deltoids, as well as the rhomboid and middle trapezius muscles of your upper back. Standing, hold dumbbells with your palms facing each other. Bend your torso forward, forming a 45-degree angle with the floor. 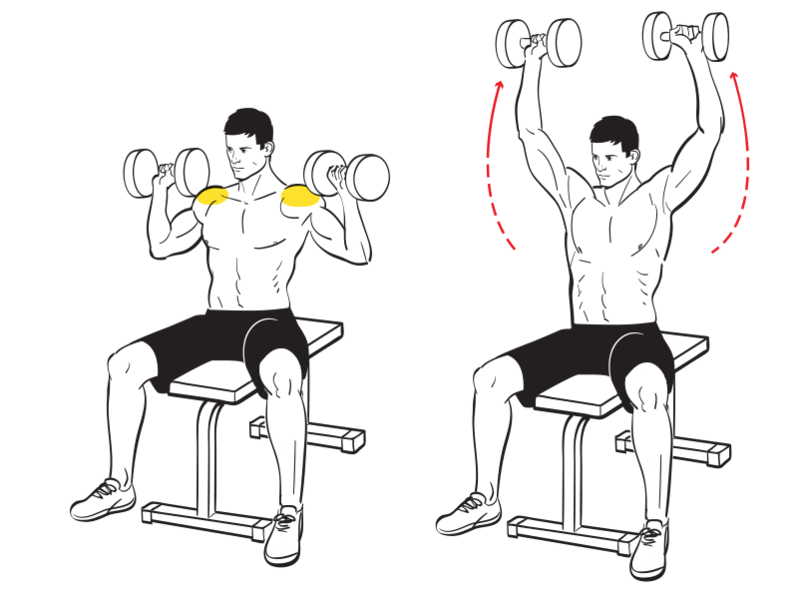 With elbows slightly bent, raise the dumbbells up and out to the sides until they are parallel to the floor. As you lift the weights, focus on squeezing your shoulder blades together. Beginner: Hold your spine in a strong, flat neutral position throughout the movement. If you are not strong enough to do this on your own today, use a bench set to an incline to support yourself. Along with building anterior, medial and rear deltoid strength, this exercise also targets the upper back. Sitting, hold a dumbbell in each hand, and raise both weights to shoulder level with palms facing out and elbows bent. 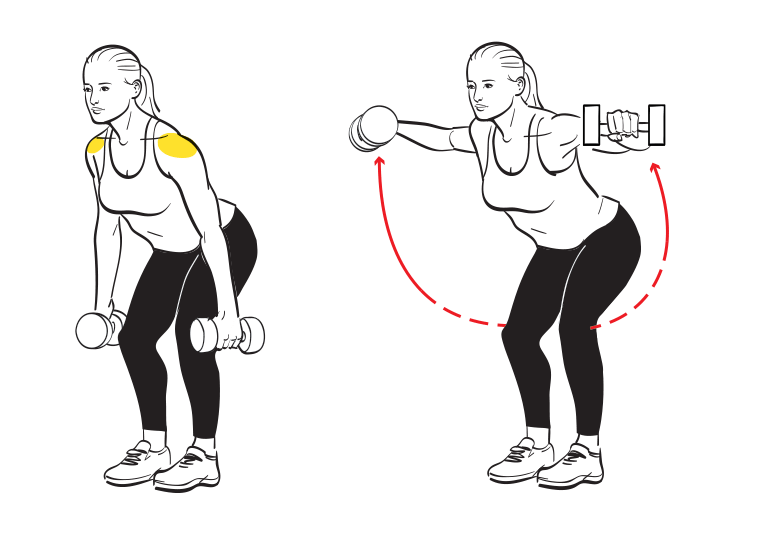 Press the weights up and toward each other as you straighten your arms. At the top of the movement, keep a slight bend in your elbows. Slowly bring down the weights, and return to the starting position. Beginner: To support your body throughout the shoulder press and decrease the demand on your abs and back, use a bench with a back support. Focus on full range of motion from shoulders to arms straight, with your arms in line with your ears. Intermediate: Remove the back support and slow down the movement for a two-second lift and a two-second descent. Expert: Stand up. Consider including an explosive lift while continuing to lower the weights slow and under control.